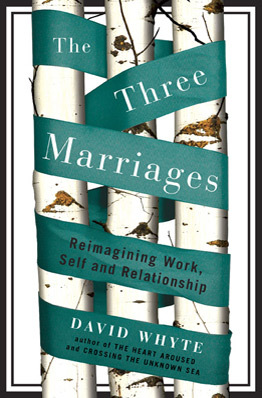 The most difficult of David Whyte‘s three marriages, found in his wonderful book, The Three Marriages: Reimagining Work, Self and Relationship, is the marriage to the self, which lies beneath both the marriages of work and relationships. What is heart-breaking and difficult about this inner self that flirted, enticed, spent time with and eventually committed to a person or a career is that it is not a stationary entity; an immovable foundation; it moves and changes and surprises us as much as anything in the outer world to which it wants to commit. Neglecting this internal marriage, we can easily make ourselves a hostage to the externals of work and the demands of relationship. We find ourselves unable to move in these outer marriages because we have no inner foundation from which to step out with a firm persuasion. It is as if, absent a loving relationship with this inner representation of our self, we fling ourselves in all directions in our outer lives, looking for love in all the wrong places. If we are involved in the outer world in ways that betray our conscience or deeply held beliefs, then even simple internal questions can become very difficult to ask. As if we intuit that drinking from the well will clear our eyesight and help us see what is real in the outer world and that once we have built that outer solid wall, brick by brick over long years through equally long effort, the gift of seeing that reality is the last gift in the world that we want. We can easily become afraid of the internal questions and the silences that illuminate them — which is why of the three marriages the marriage to oneself is the hardest. The act of stopping can be the act of facing something we have kept hidden from ourselves for a very long time. In a world that doesn’t sleep, where we are bombarded from morning to night, this is the most difficult marriage. To the outward striver— that is, most of us— it can seem as if this internal marriage is asking for a renunciation of the two outer marriages. Feeling this can come as almost a relief, a way out, for in the name of our many responsibilities and duties, we can use it as the perfect excuse not to look inside at all, feeling as if our outer world will fall apart if we spend any time looking for the person who exists at the intersection of all these outer commitments. All of our great contemplative traditions advocate the necessity for silence in an individual life: first, for gaining a sense of discernment amid the noise and haste, second, as a basic building block of individual happiness, and third, to let this other all-seeing identity come to life and find its voice inside us. Almost all of our traditions of instruction in prayer, meditation or silence, be they Catholic, Buddhist or Muslim advocate seclusion or withdrawal as a first step in creating this equanimity. Small wonder we feel it goes against everything we need to do on the outside to keep our outer commitments together. Intimate relationships seem to demand endless talking and passing remarks; work calls for endless meetings, phone calls and exhortations. In the two outer marriages (work and relationships) it seems as if everything real comes from initiating something new. In the inner world we intuit something different and more difficult. It can be disconcerting or even distressing to find that this third marriage; this internal marriage, calls for a kind of cessation, a stopping, a fierce form of attention that attempts to look at where all this doing arises from. “Thank you,” we say, “but I don’t have time. Please give it to me in three bullet points that I can look at later, when I get a moment, when I retire, when I’m on my deathbed or even when I’m actually dead, surely, then, there’ll be time enough to spare.” Trying to be equal to Lao Tzu’s opening remarks in the Tao Te Ching when we have no practice with silence and the revelations that arise from that spacious sense of reality can be like a novice violinist trying to play the opening notes of a Bach concerto. We can be so overwhelmed by the grandeur of the piece that we give up on our beginning scales. The third marriage to the internal self seems to be to someone or something that in many ways seems even less open to coercion or sheer willpower than an actual marriage or a real job. Not only does this internal marriage seem to operate under rules different from those of the other two outer contracts but it also seems to be connected to the big; we might even say unbearable, questions of existence that scare us half to death and for which we have no easy answer. Like a skittish single unable to commit to the consequences of a full relationship, we turn away from questions that flower from solitude and quiet. This is where we live. This is where we die. The sudden absence of our partner waits for us. The end of our work or our retirement waits. The hospital bed waits. Right now, in some obscure medical appliance company in a corner of a bleak industrial estate, the very bed on which we will lie, trying to get the great perspective, is perhaps being manufactured as we read. We don’t want to know, of course, but all our great contemplative traditions concerned with this marriage, say, this willingness to look at the transitory nature of existence, are not pessimism but absolute realism: life is to be taken at the tilt, you do not have forever, and therefore why wait? Why wait, especially until your faculties have atrophied or your youth has gone, or you have lost confidence in your self? Why wait, to be, as the poet Mary Oliver says, “a bride to wonder”? To become a faithful and intimate companion to that initially formidable stranger you called your self? Whyte’s book is a fascinating exploration of the three marriages that challenges our conventional notions of balance.